Detectives tracing a Lexus stolen from London have ended up tracking it to Uganda - where it was found alongside a fleet of British cars worth more than £1 million. The £50,000 SUV was fitted with a state-of-the-art tracking device, which activated as soon as it was taken from outside a property in west London. 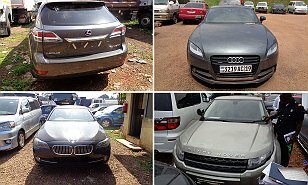 As a result the National Crime Agency was able to use a smartphone app to trace the journey of the stolen RX450h 6,000 miles to the Uganda capital Kampala, where they were stunned to find it alongside 28 other luxury cars which had been stolen from the UK by the car-smuggling gang. Luxury right-hand-drive cars are in great demand in land-locked Uganda, where locals still drive on the left as part of the British colonial legacy but import companies struggle to transport new vehicles.